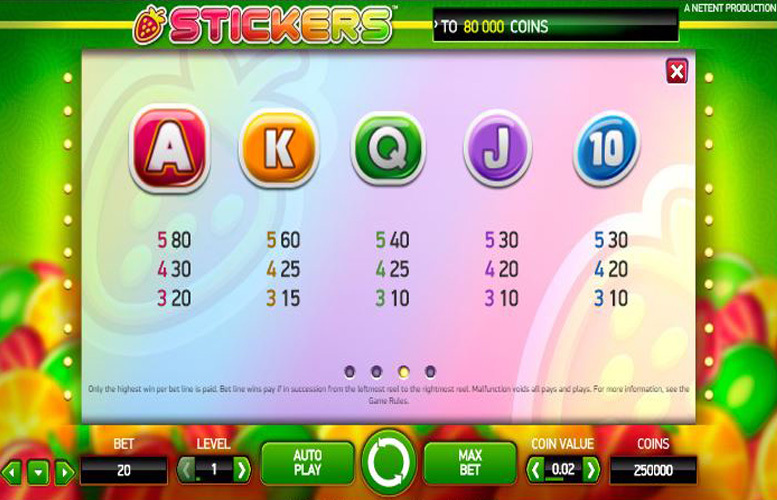 Stickers is a simple and colourful five reel and three row slot game with a theoretical return to player percentage of 96.69% and 20 pre-set paylines. 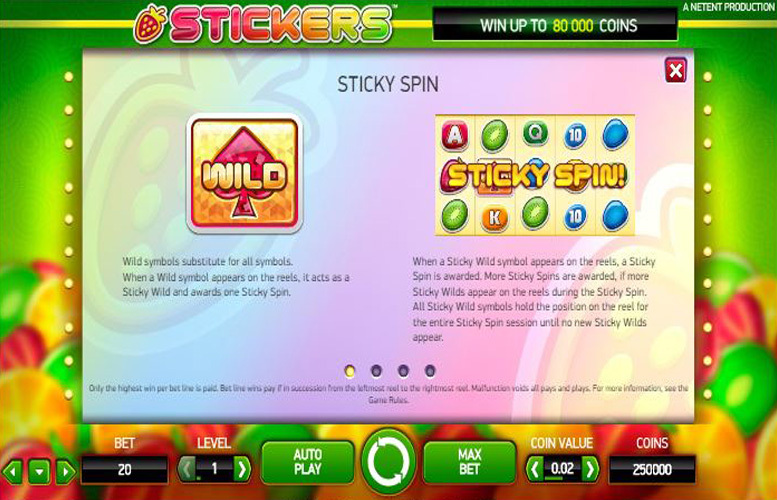 The straightforward gameplay includes Sticky Wilds and linked Sticky Spins and can lead to a jackpot worth up to £80,000 depending on the bet level and coin value choices made by the player. One of a number of slots that keep things simple and don’t introduce many additional features, Stickers is a game which will appeal to only a specific type of player. To find out if you are amongst them, our full review will tell you everything you need to know about the slot’s top jackpot, special symbols, paytable and betting limits. Stickers is in many ways a quintessentially traditional slot and that is reflected in the fact that all wins come from the display of paytable combinations across the game’s 20 pre-set paylines. The most valuable combinations are those which are made up of five identical symbols and the most valuable symbol is the strawberry symbol. A five strawberry symbol combination returns winnings worth 400 times the bet level set by the player for the spin. The maximum bet level is ten, meaning that the top payline jackpot possible equals 4000 coins. The slot’s overall top jackpot, therefore, equals 80,000 coins which can be won if the most valuable combination covers all 20 paylines at once. At the top coin value setting of £1, that jackpot is worth £80,000. This is one of the more straightforward slots around and as such, actually only includes one type of special symbol. That is the game’s wild symbol. Wild Symbol – the wild symbol can appear on any reel, substitutes for any other symbol and always goes towards creating the most valuable possible combination for any payline. Alongside that traditional role of the wild symbol, however, Stickers’ wilds also play another part in the game. Whenever a wild symbol appears on the reels, it acts as a Sticky Wild and stays in position while the rest of the reels spin again in what is called a Sticky Spin. That Sticky Spin is played at the same bet level and coin value as the spin which triggered it and can itself lead to a further Sticky Spin if another wild symbol appears. All of the symbols that appear on the Stickers reels depict either colourful fruits or letters and it is the fruit symbols which are the more valuable. The most valuable symbol of all is the strawberry symbol and if five of those line up along a payline, the combination pays out at a rate of 400 times the bet level. That means that at the highest available bet level of ten, the top payline jackpot would equal 4,000 coins and if the best combination is achieved on all 20 paylines that would result in the top overall jackpot of 80,000 coins. Behind the strawberry symbol, the next most valuable is the orange symbol which pays at a rate of 300 times the selected bet level. 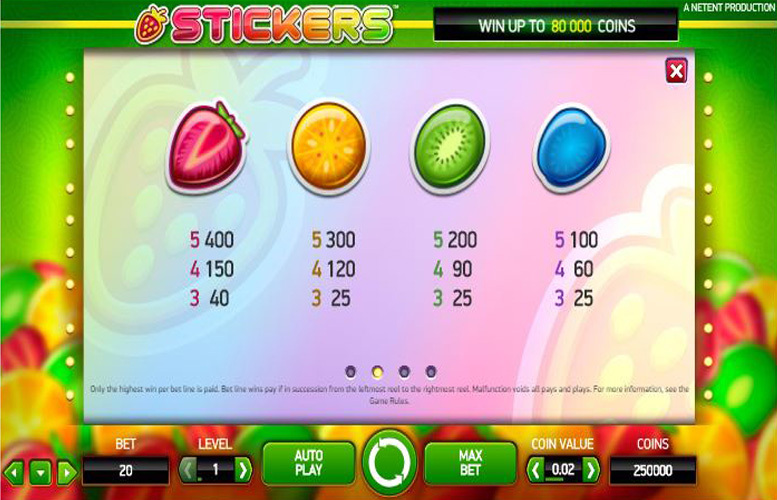 Players of the Stickers slot game can control how much they bet per spin during the game by altering both the coin value and the bet level. Coin value determines how much each coin is worth between 1p and £1 whilst bet level sets how many coins are bet per payline from 1-10. There are seven different coin value options and ten different bet levels, which means that players have a large number of stake choices between the minimum of 20p and the maximum of £200. Those minimum and maximum figures are reached by either selecting the lowest coin value and bet level or the highest coin value and bet level, respectively. 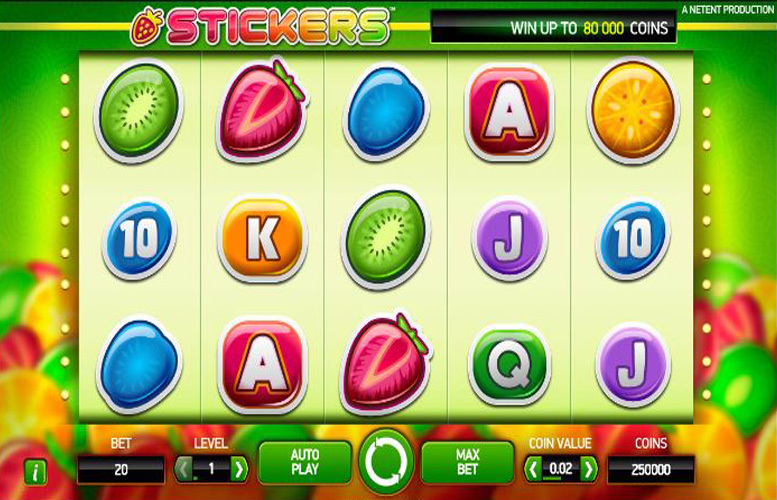 Stickers, in general terms, is a slot which does not offer players as much as many other games which are available. The gameplay of the slot is very simple, additional features and elements are extremely limited and jackpots are comparatively small. On the other side of the coin, where Stickers does excel is in being really easy to understand and to start playing immediately. There are no bonus games or special features, which would require a player to peruse the game rules before they start and all wins are achieved in a traditional slots fashion. The game, too, offers players a good level of control over their betting amount by making both bet level and coin value easily adjustable. Overall, therefore, Stickers is a good option for any player looking for a quick and simple game to play for a few minutes here and there. Anybody looking for a more interesting and exciting slot experience, however, may wish to choose a different game entirely.